Berkeley passes a 25 cent fee on disposable coffee cups - Sebastopol to follow? Thread: Berkeley passes a 25 cent fee on disposable coffee cups - Sebastopol to follow? Berkeley approved a 25-cent fee on disposable cups, along with additional regulations requiring take out containers to be compostable and only using reusable plates and utensils for those eating in. This is similar to a proposal Michael Carnacchi made while running for Sebastopol City Council in 2016. His proposal was never adopted, or as far as I can tell, seriously considered. One notable difference between Carnacchi's proposal and Berkeley's new ordinance is that the restaurants will keep the new fee, whereas Carnacchi's proposed that the revenue (w I remember as being surprisingly high) goto the city. I prefer the revenue go to the city (why should the restaurants benefit? ), but I'd be OK with it going to the restaurants to help quell their resistance. I strongly support this idea and clearly it's time has come! Last edited by Barry; 01-23-2019 at 08:06 PM. Re: Berkeley passes a 25 cent fee on disposable coffee cups - Sebastopol to follow? Let's force businesses operating off pennies to modify their operations special for this city. Think about it... How much money is a business really making off that cup of coffee? Perhaps if our city had nothing but large operators, but this is very unfair to the smaller shops in town. Think of it this way... by adding a fee to cups, you're asking every business to keep track of every sale made in a cup. Is this $.25 going to the business? Regardless if the business keeps it or it's given to someone else (are we funding something?) it impacts the businesses' taxes. Do we have to charge another .25 for a double cup? Cause that'll be another thing for the register to keep track of. Seriously, how hard do you want it to be for a kid to run a legal lemonade stand? You are right, I'm sure businesses don't want to sell customers another item because that will be too hard on their poor overworked registers to keep track of! It's just the next thing that they are selling! Guess I'm glad I typically buy my coffee at Andy's/Roaster's which is outside city limits and wouldn't be subject to such silliness. Lots of fun for those "registers" at the farmers' markets. Lots of fun for those "registers" at the grav blossom/harvest fairs. Or is this another California law that we'll ignore when it's convenient? You can avoid the silliness and bring your re-usable cup. They keep your coffee hot much longer. Of course, if you do not care if we trash the planet, it is not your worry. I am sure that the businesses will be glad to ring up an extra $.25 for each cup. They keep that, but you probably did not read that far. Speaking of reading that far, this is a Berkely ordinance, not Sebastopol, although I hope we will get on board in a desperate attempt to save Mother Earth. Last edited by Barry; 01-28-2019 at 03:45 PM. It's my belief that laws banning bags, straws, whatever are rather pointless when there's nurdles making their way to the ocean. These laws are typically poorly written and don't fit many situations outside of retail. They are anti-tourist (unless you somehow expect tourists to be traveling from other places with these items). Companies won't enjoy a .25 cent markup, they'll complain about lost business to out of town. The only way we start to improve our environmental situation is developing better sorting systems, large scale domestic recycling and better commercial composting. Fungii, algae, bacteria, and animals have all been found to consume plastics, the lack of competition in our government contracted trash systems just have no motivation to try to implement them. Edit: A requirement for all disposables to be made of compostable material is something I would support. Last edited by Barry; 01-25-2019 at 10:29 AM. Currently, most coffee shops offer a 10-cent discount when you bring your own cup. Under this proposal, customers will be charged 10-cents if they don't bring their own cup. The amount of cups used at one very small coffee shop downtown is 1,400 cups per week, which equals 72,800 single use cups discarded annually by this one small coffee shop. Multiply 72,800 cups times the number of independent coffee shops in Sebastopol and figure in the cups from two Starbucks, MK Jelly Doughnuts, Taylor Lane, Gas Stations, 7-Eleven and other convenience stores, and the estimated amount of single use cups discarded annually in Sebastopol equals 2,000,000 plus. 2-million discarded single use coffee cups times 10-cents is projected revenue of $200,000 in the first year. This revenue will be used to fund a full-service recycling center in Sebastopol that collects electronics, batteries, plastic bags, bottles and cans, toxic chemicals and paints, etc. 2-million discarded cups means 2-million plastic lids that can easily end up in the storm drains, which run directly into the lagoon. It seems evident that this tax proposal will be good for our environment and similar to the 10-cent paper bag tax, it will be incentive for people to change their habits and carry reusable cups. This 10-cent single use coffee cup tax proposal unlike Berkeley’s 25-cent cup fee, would need to be placed on the ballot for the voters to decide where a 2/3 majority is required for passage. This forum and others like it, seems like a good place to get a feel for how the public will respond before going through the expense of a ballot measure. All comments and suggestions are welcomed and appreciated, thank you. Great idea, Michael. I wish we had more people in government who think as you do. Thank you and I just hope we pass it!! Where is the closest recycling center to Sebastopol? What are alternate options for spending the $200,000 projected revenue? Last edited by Barry; 01-27-2019 at 12:51 PM. 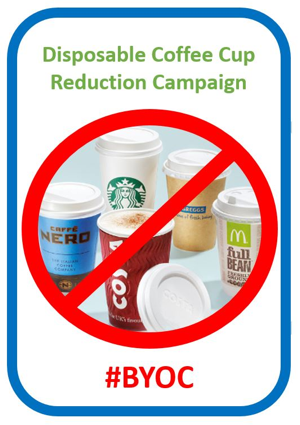 Is the primary goal to raise revenue or to eliminate the disposable coffee cups. Either way, a quarter, not a dime, makes more cents and more sense. Look at how many people don't care about a dime a bag. New clay shops in town could lead to more reusable mugs. Maybe there will be city-wide common cups you can pick up and drop off like the forks at the farmers' market. Can anybody comment on the questions below? Last edited by Barry; 01-28-2019 at 03:46 PM. coffee catz has them, on occasion they run out. king falafel has them for water & coffee. until then, bring your reusable mug, & ask if you are having coffee, tea, hot chocolate, water, etc. in!! ...Maybe there will be city-wide common cups you can pick up and drop off like the forks at the farmers' market. Both community cups and forks would be struck down in minutes by a competent health department. The farmers' markets vendors do not have the water (especially hot water) to properly clean such items for re-use. I hope there is someone taking these to a proper commercial dishwasher. Even a mobile taco/coffee truck does not carry enough water to be washing reusable dishes. Additionally, it is unsanitary for workers to be handling used cups. I could see that an exemption for farmer's market and mobile vendors from this new tax. I know of one on Santa Rosa Ave in Friedman's area, and another in Windsor. I'm with Chef, we already have too many laws. Also, I'm very frugal and an environmental radical, often mistaken for homeless though I rent homes to other people. Usually, I make my own coffee or tea but when I buy I always have my own mug and notice that it saves me 25-50cents depending on the shop. This law would probably cost me money.